New York City Department of Transportation (DOT) Commissioner Janette Sadik-Khan and US Department of Transportation Secretary Ray LaHood today announced the launch of the new LOOK! safety campaign to highlight the critical need for motorists and pedestrians to pay attention when driving and crossing the street and also introducing the City’s first widespread use of “LOOK” pavement markings at crosswalks alerting pedestrians to oncoming traffic. Ads tailored to drivers feature eyes and will appear on MTA/NYC buses’ rear advertising panels. These ads remind motorists to “Drive smart/LOOK!” with the dramatic statistic that 57% of traffic fatalities involved pedestrians. Another underscores the life-saving benefits of motorists looking before they turn, noting that half of all New Yorkers killed last year by cars at the crosswalk had a green light. The street treatment’s distinctive lettering, installed with the same durable thermoplastic used in other street markings, spell the word “LOOK” with “eyes” drawn within the O’s mimicking eyes looking in the direction of oncoming traffic. Commissioner Sadik-Khan and Secretary LaHood unveiled the new safety campaign at Second Avenue and 42nd Street in Manhattan, one of the dozens of intersections where the markings and ads are featured. Nearly 9,200 people were injured and 41 were killed in New York City in crashes involving driver inattention, more than any other cause, in 2010 alone, the last year for which detailed traffic crash data is available. The ads, which will be expanded to nearly 200 intersections and more than 300 buses, build on recent public education campaigns that have taken on the biggest safety issues on New York’s streets, including speeding, drunken-driving, and other initiatives focused on all transportation modes. This sustained campaign is also part of a larger safety strategy of engineering, education and enforcement that has contributed to making the last five years the safest in New York City’s recorded history. The pedestrian ads and markings are being placed together at targeted locations with histories of crashes resulting in serious injuries and fatalities. The initial rollout began in July in all five boroughs, including at Grand Concourse and Bedford Park Blvd. in the Bronx; Avenue D and Utica Avenue in Brooklyn; Madison and Montgomery streets in Manhattan; Roosevelt Avenue between 76th and 77th streets in Queens; and Clove Road and Victory Boulevard on Staten Island. Bus ads are expected to run through December. They will run in tandem with the pedestrian-focused ads and markings to extend the reach of LOOK’s important safety message as lighting levels decrease due to daylight-saving time and foot traffic tends to surges in commercial areas due to the traditional holiday season. 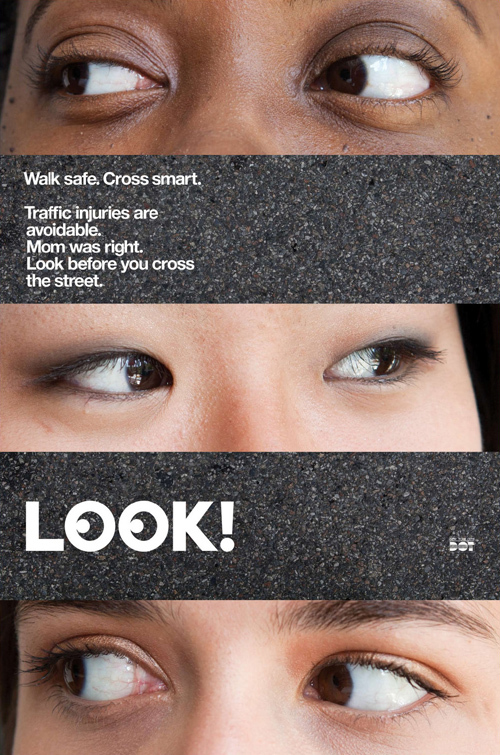 The LOOK campaign originated in 2006 to enhance safety for all street users, and particularly to build awareness among motorists and pedestrians of the growing number of bike riders using the streets. The re-launch of LOOK complements DOT’s other education efforts designed to reach one or more transportation modes. DOT recently partnered with the NY Knicks to launch the “Heads Up” campaign, which spotlights unsafe behavior and reminds pedestrians, bike riders and motorists to stay alert, obey the rules of the road and keep themselves and others safe. The “That’s Why it’s 30” and “You the Man” campaigns educate motorists on the safety benefits of following the 30 m.p.h. speed limit and to use a designated driver every time they drink. New York City’s streets are the safest of any big city in the United States. Unprecedented safety redesigns, traffic engineering and education helped bring traffic fatalities to the lowest levels in recorded history in 2011 and made the last four years the safest period in city history. For more information about DOT’s ongoing efforts to enhance safety, visit www.nyc.gov/dot.